Biosthetique has developed GLAM COLOR ADVANCED a product that makes your hair more soft and fragrant, ensuring a brilliant color effect. 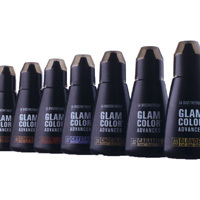 The GLAM COLOR ADVANCED makes hair shine of new luster regardless of the color tone of the hair and independently from the fact that the hair is already colored, that has streaks or is natural. Has an effect handling and its properties refresh the color. The conditioner is easy to use and gives the hair of vital reflexes, a very glam shine, protecting them in depth in a few minutes.